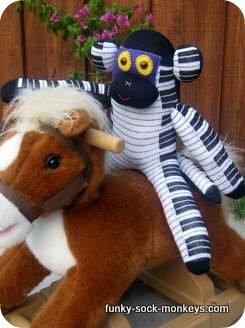 Fun monkey sock craft project with piano socks. 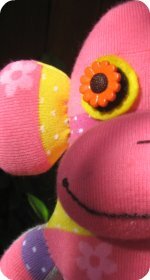 Free sock monkey pattern for making sock animals. 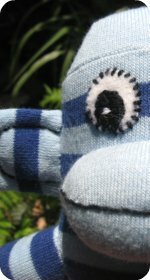 You can vary the pattern to make any sock animal you'd like. Cut, sew and stuff the body as per the basic sock monkey instructions. 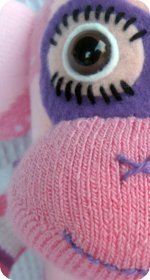 When it comes to sock crafts there are no limits to stuffing your sock animal, go crazy and stuff as much stuffing in as you can. I don't usually stuff them this fat but they sure are cuddly when they are this pod-gee. Eyes: Step 1: Cut purple felt into a large rectangle. Lay over eye area positioning it over to one side, so it is not centered. Step 2: Attach the mouth by sewing through both the sock and the felt. Step 3: Cut two oval shapes from yellow felt, cutting a small hole in the center of each. 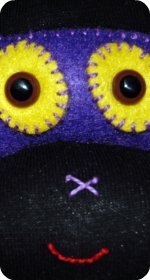 Place them onto the purple felt, position them where you'd like the eyes to sit. Push a pen through the holes, to mark the purple felt and cut two very small holes in the purple felt. Step 4: Attach the plug in eyes by pushing through both the yellow and purple felt and secure. 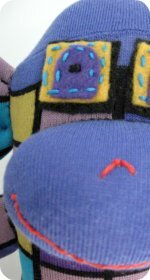 Step 5: With purple embroidery thread, stitch around the yellow felt to secure. Step 6: Stitch the purple felt to the head with purple thread and stuff gently before stitching the whole way around. Ears: Sew ears leaving only a very small opening to stuff them. 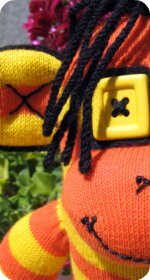 Stuff them fully and stitch onto your sock animals head. Since the ears are being attached by such a small amount of the sock, it pays to stitch around them a least a couple of times to really secure them on. Attach his arms and tail. 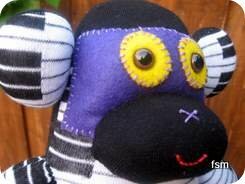 Craft a face by stitching on a nose and mouth and your monkey is complete. 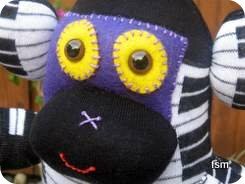 Used a themed monkey sock for your toy is great, there are so many themed socks available so you'll be able to create something truly unique. TIP: To craft super bendable ears, leave only a very small opening when sewing the ear pieces together. The smaller the opening, the less area there is to attach the ears to the head (as in the picture above), resulting in more bend ability.